This article is about Atlanta Skyline #014Z drawing of midtown at Piedmont Park, which is for sale at discount with prints by artist Stephen F. Condren, BFA-SAIC, of Condren Galleries, a Fine Arts Gallery, offering JPEG & PDF scans. This article is about my drawing of the midtown Atlanta, Georgia, skyline at Piedmont Park. 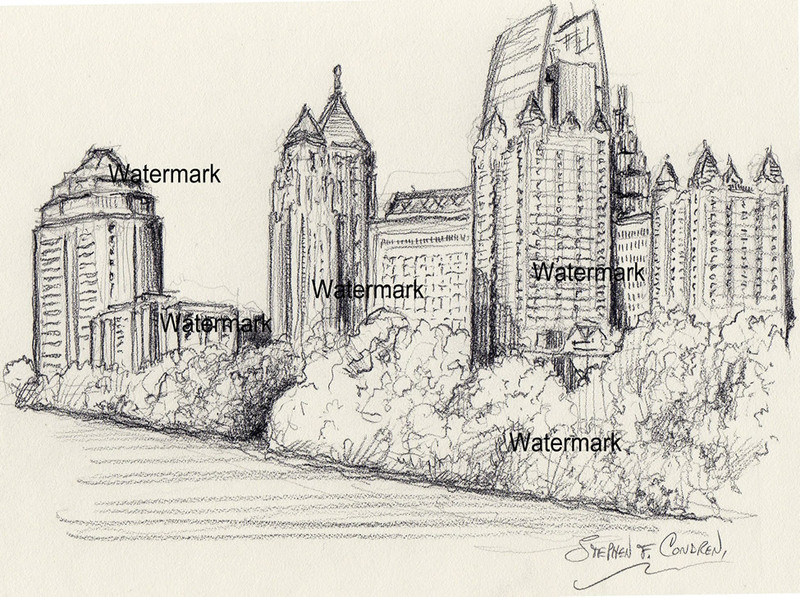 Atlanta Skyline Drawing Of Midtown At Piedmont Park #818. Key elements to this work of art are as follows. A firm grasp of you perspective with a solid knowledge of your horizon line. Possess supplies at hand ready for focused detailing. Have and good understanding of architecture and structural detailing. This drawings shows the midtown portion of Atlanta at Piedmont Park. We are just by Lake Clara Meer but it cannot be seen in this rendering of the city. The most complicated element of the drawing was the sloping landscape, this is because I had to draw the scene very accurately so as to keep the skyscrapers in the background look upright and straight, not as though they were sloped or off alignment. The drawing is a success! I am very please in how I captured the gentle slope down to Lake Clara Meer. I used soft horizontal strokes on the lawn the gentle let your eye move downward.